This is one of the larger presents my kids and I gave to my wife for her birthday. 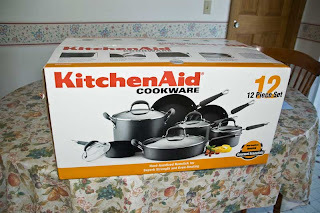 She's been wanting some nice matching cookware for quite some time and even insisted that we give her that for her birthday. I spent over an hour at the store trying to figure out which one to get. There were so many brands, sizes, sets, colors, and types. I had to make sure that she would be happy with the color and sizes of the cookware. They also had to work well with our kitchen. Thankfully, my wife love it and that's all that matters. The kids showered her with homemade cards. I dropped off a card, some flowers and a cake at her work first thing in the morning. We took her out to Chili's to celebrate her birthday. The kids were really excited. We all had a nice time together.